Something rather serendipitous seemed to be in the air this holiday season. Without any conscious effort to coordinate the next two pieces in my Decision Portrait Series, I ended up taking the photos for Rabbi and Priest within two days of one another. 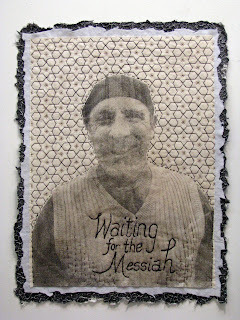 The initial transfer for the priest was less than perfect, so I started stitching on the rabbi....right before Christmas. It seemed so fitting....waiting for the Messiah. 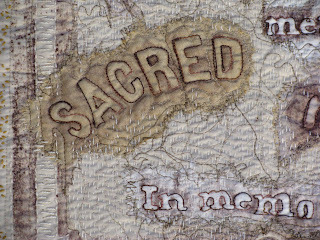 The stitched words for the priest will be "Called to Serve". While designing my own "Star of David" inspired Blackwork pattern (Don't faint....I can actually manage counted thread embroidery when absolutely necessary! ), it occurred to me that both these men were "called to serve" and both these men are "waiting for the Messiah"....whether for a first or second visit doesn't matter. Thus, I spent much of the holiday week thinking about our global cultural, religious, and historic similarities. It was a wonderful way to stitch and celebrate. I am thrilled with this piece....especially the Blackwork. There's a good chance that my desire to adorn the background in this manner is the result of blended cultural arts too. I recently read Pulitzer Prize winner Geraldine Brooks' People of the Book. My mom and dad practically insisted that I read it, and they were right. I LOVED IT! The fictional plot focused on the real 14th c. Sarajevo Hagaddah. My mind danced with all the beautiful Moorish patterns that many illuminated manuscripts from the Middle East include. I knew I wanted something that reminded me of these books. During the year I've tried not to fill my personal blog with too much CYBER FYBER information...but each day now brings me closer to the actual exhibition. Most of my time is spent in preparation for the installation, creating new press releases, etc. One of the things that inevitably happens with the postal system is that some mail gets lost! I had to write to a few participants to say I'd never received their trades. I promised "something" in return.....but had no idea what! Well, it's going to be Christmas ornaments. I made another "batch"! I've also received an email or two asking about the CYBER FYBER postcard and ATC voting. The question is: Can I vote for more than one? YES! By all means! Vote away! The People's Choice Award is really just for fun.....Vote! 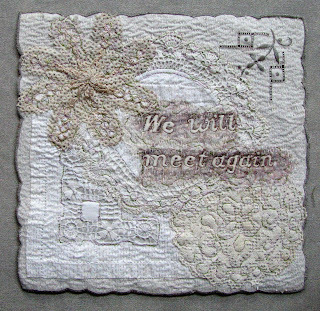 The on-line exhibition is here for postcards and here for ATCs. Most of the artwork from the Invitational Artists has arrived. For the next day or two I'll be photographing it and uploading it too! There's still time for anyone to participate in the International Random ATC Swap too! Every day more ATCs arrive for this. So....what else has been happening here in Columbia? Well, my elder son Mathias is home for just over a week from Birmingham, England where he dances for Birmingham Royal Ballet (BRB). He's been busy contrast and color correcting all the photos he took last January while the company toured Japan! Okay....he's a little slow on getting this done....but....I have Photoshop on my computer. So....soon there will be photos on My Family Blog from this trip! Better late than never! I think one of the reasons this task is finally getting done is the fact that BRB is touring China this January! Mathias needed his camera's chip cleared for the new images! Columbia is the capital of South Carolina. Our largest newspaper is The State and it publishes a monthly magazine called Lake Murray Columbia. Actually, there's a "northeast" magazine too...it is exactly the same except for the cover. 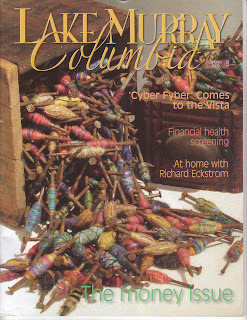 Both magazines feature CYBER FYBER inside....but the Lake Murray Magazine has an image of my wrapped nails on the cover! It came out on the same day that I received notification from HANDCRAFTED, the national fine crafts juried exhibition in Rocky Mount, North Carolina. These very nails and Bessie's Quilt were accepted! I'm thrilled with the coverage! Interest in the exhibition is building! To read the article, click here.....I've posted it on the CYBER FYBER journal! I was going to include the recent article and COVER of the recent Lake Murray Magazine with this post.....but I've been sitting in front of the computer since early this morning. I'll post this great coverage tomorrow...Christmas Day. For now, I'm thrilled to announce that the ON-LINE EXHIBITION is up! The ATCs are here; the Postcards are here! As the last few arrive, I'll update. In fact, there are still plenty of postcards available and a few ATCs. Just today my close friend Doni Jordan came by Mouse House to trade postcards! Doni just got a blog....in fact FOUR blogs. Her main/solo/personal place will be here but you can find the others on her blog profile. PLEASE....if you find an error (spelling, link, whatever!) Please email me or leave a comment somewhere! I'll fix it! ALSO: PLEASE NOTE: I'm going to have a PEOPLE'S CHOICE AWARD for the traded postcards and the traded ATCs. The postcard and ATC with the most combined comments and votes from the actual exhibition at Gallery 80808/Vista Studio will win a prize! So far, Lori Brown, owner of Columbia's fabulous House of Fabrics on Main Street, has donated an extremely large bag of swatches, remnants, fabric scraps, buttons, and assorted "goodies". I'm collecting even more and will throw in a bunch of great things from my personal stash too! SO VOTE! That means....leave a comment on the on-line exhibition....for the ATC and postcard you like the best! Don't leave your vote here! Leave it on the entry for which you want to vote! Happy Holidays! Every day in December seems to be an adventure. CYBER FYBER duties, Christmas picture framing, artistic decorations, and family connections fill all available moments for me.....but.....I'm finally done with the framing! Yippee! Mathias arrived home yesterday and will spend the week! Yippee! I've got an important CYBER FYBER announcement and I've finished another piece in my Decision Portrait Series......lots of yippees! Above is the latest portrait in my series. I'm especially happy with this piece because it is exactly what I wanted to depict before I found the perfect person to pose! This wonderful lady said that going back to college was the best decision she ever made. An education is never complete. Each of us really should be learning new things every day. One of the things I learned this year was that my CYBER FYBER "wish list" for the invitational portion of the exhibition was incomplete. 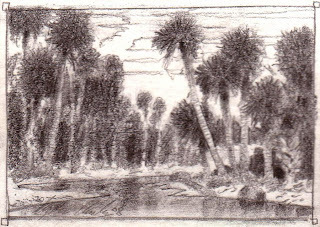 How could I have known that trading postcards and ATCs with talented stitchers all over the world would bring me into contact with one IN MY OWN STATE! Truly, the supportive, global Internet community of fiber artists has many benefits. 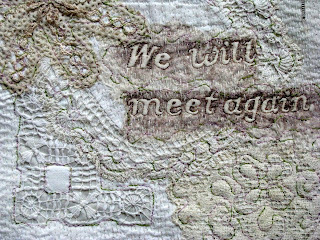 The fiber artists I selected were meant to represent these different aspects....but I hadn't thought about how blogging and websites might bring me into contact with someone local! 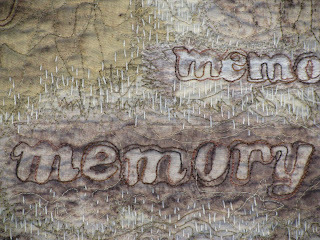 I'm thrilled to introduce Fulvia Boriani Luciano as the newest fiber artist in the Invitational section of CYBER FYBER. 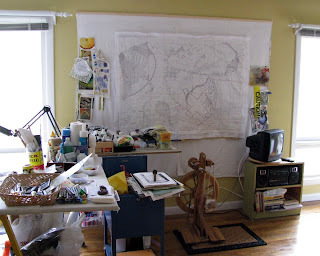 Below is a photo of her sun-drenched studio in Rock Hill, South Carolina. 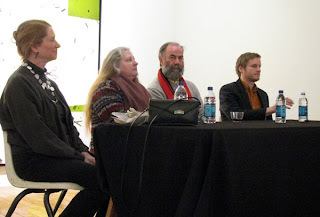 I went last Thursday and selected several fabulous works for the upcoming exhibition. I've also written more about this on the CYBER FYBER journal. It includes lots of other photos. Below is one of Fulvia's design wall. Click on image to enlarge....and see the CYBER FYBER postcard for which Fulvia traded hanging on the right side. I'm thrilled to announce that the CYBER FYBER ATCs and the CYBER FYBER Postcards each are presented as videos on a brand new blog! The video blog will include all the books in the exhibition plus videos created of the opening reception, Fiber Day, and ATC Day! The on-line exhibition of CYBER FYBER will be available on Christmas Day! 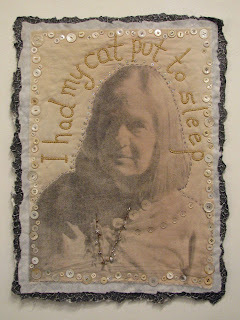 I couldn't sleep at night if I didn't stitch at least a little bit every day. With CYBER FYBER preparations, it can be difficult....but....not impossible! First of all, there's the weekly TAST challenge (Take A Stitch Tuesday) to keep me engaged. I've been stitching but not posting until today. So below are the last four stitches....including the running stitch! 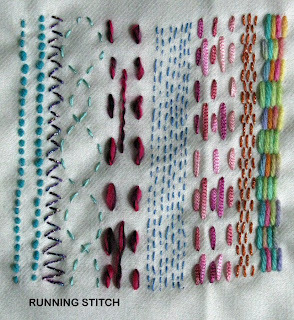 Yes, the running stitch is likely the second stitch one learns...about two seconds after learning "the straight stitch"! It is, however, one of my favorites. 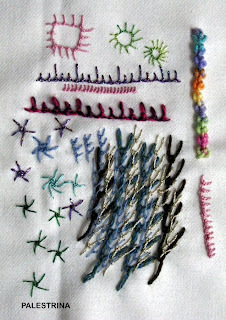 I was reminded of its textural qualities last summer while in Sweden with Annica at the Swedish Embroidery Seminar. We were exposed to the soft, narrative inspired kantha clothes of India. I had no idea how profound this experience would be at the time, but I'm hooked on the running stitch. 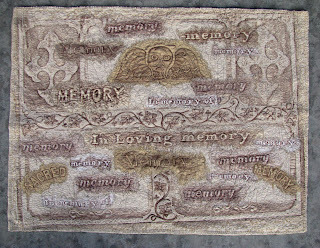 My grave rubbing quilts are full of them! I find it meditative to do. 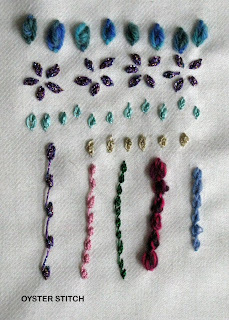 Above is my TAST (Take a Stitch Tuesday) example of the running stitch. 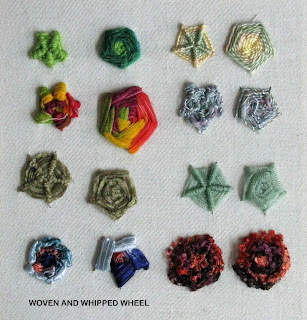 Above are examples of woven and whipped wheels. 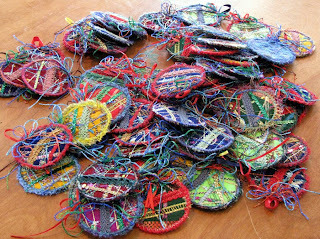 I selected several different types of ribbon, yarn, and thread with which to experiment including chenille, perle cotton, knitting tapes, and some that simply can't be stitched through any ordinary fabric but work for these stitches very well. Above is the Palestrina stitch. This was a new one for me. I particularly liked the chunky effect created using variegated knitting yarn....upper right. Above is the Oyster Stitch. This, too, was one that I'd never done....and likely will never do again! Now...off to learn the Basque stitch...whatever that is! Check back later in the week....I'll be posting videos of the CYBER FYBER postcards and ATCs...teasers for the on-line exhibition! Don't forget to consider the Random International ATC Swap too! Although I've already received many ATCs for the International Random ATC Swap to be held on ATC DAY, Saturday, January 17 at CYBER FYBER, I have officially created a blog for this purpose now! It is here! Anyone can participate! There's no restriction on age, location, or artistic medium! The deadline is obvious! ALL ATCs MUST BE RECEIVED BEFORE JANUARY 17, 2009! To join in, here's what to do! 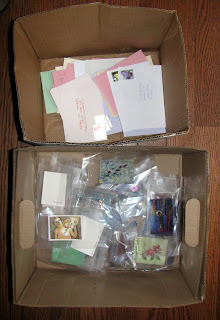 Include a self-address, sufficiently stamped envelope for each ATC you send. If you are located outside the USA....send the envelope with stamps from your own country! We will be bundling those headed to each country and mailing them to a volunteer who will drop them into the postal service! 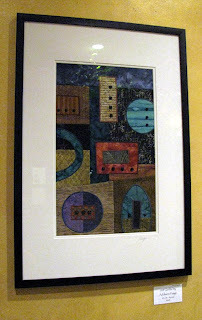 I personally covet this ATC created by my mentor Stephen Chesley. It is called Lagoon. It is in his catalog as # 10,624. Stephen is one of the professional artists with studio space at Gallery 80808/Vista Studios, 808 Lady Street....the location for CYBER FYBER. 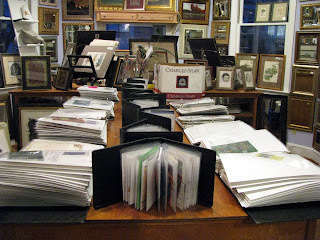 If you haven't seen Stephen's work, check out this blog post I wrote....with images of the studio and catalog! There are some other wonderful ATCs created by other artists at Gallery 80808/Vista Studios already in the box....waiting to be swapped! The invitational section of CYBER FYBER has been edited....and I've been in contact with each of the invited artists....and received some wonderful artwork already! I've also created a mailing list for a special email invitation to the exhibition...everyone who traded should be on it! I'm excited! I hope everyone is too! Next....creating the on-line exhibition....no peeking....I'm not going to upload the photos until all the posts have been created! I'll edit the pictures into the posts later! I met Elizabeth Cherry Owen while at the MacNamara Foundation on Westport Island, Maine. Elizabeth is an awesome fiber artist. 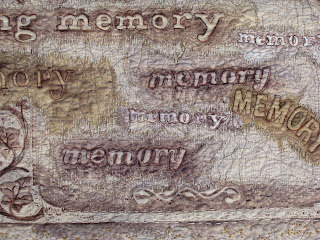 Her art quilts dazzle with intricate stitches, buttons, found fabrics, and a personal narrative that touches upon her Southern roots but also belies a love of cultural diversity. 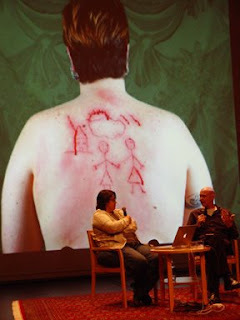 Elizabeth's work has been exhibited nationally and internationally. 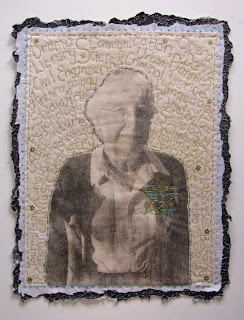 Robert Shaw included her work in The Art Quilt, the definitive survey of contemporary quilts published in 1977. Basically, Elizabeth is an awesome fiber artist! Yet, the Elizabeth I met was in mourning. Only the week before she'd had to put her beloved cat Stoney to sleep. She'd prayed for days for him to quietly just slip away; but, in the end, she had to make the difficult decision herself. We were talking about decisions. Some of my finished pieces in the Decision Portrait Series were hanging on the design wall behind us. We talked about our pets, mortally, and humane responsibilities. I asked Elizabeth if she was willing to pose. She said this was a way to commemorate her cat. I hope the portrait does justice to both Elizabeth and her cat. I know there are many of us who have had to make this choice, who mourn, and who are facing this situation. Working on CYBER FYBER is going very well. I've been updating the "Invitational Art" section and also created a video of the fabulous Take a Stitch Tuesday fiber book made by Emmy Schoonbeek of the Netherlands. The video is here! I've been working on this quilt for several weeks....hand-stitching every night before I go to bed. I don't seem to want the edges bound....just raw with the blanket stitch. I feels right to me. It's been just over a week since I last posted. Time is flying by...as it always does during the holidays. This year, however, seems different. For one thing, there's CYBER FYBER looming on the horizon. I've been up to my elbows in preparations. Everything really is falling into place, but it requires plenty of attention. It is very exciting. In fact, the chic, artsy magazine Undefined just came out with an article in it. It's so new that I haven't yet found one in any of the local shops that stock them...but...it's on-line....Book Four, starting on page 30. I'll scan and post just the CYBER FYBER article when I get a "real" copy. Other magazine articles are currently being written, press releases are being sent (and available here! ), Fiber Day (in partnership with Creative Sewing Center) has a schedule of events now, and I've just gotten 5000 4" x 6" cards to distribute in other galleries, shops, restaurants, etc. I'm in the process of updating the entire CYBER FYBER site....getting ready to create the on-line exhibition. 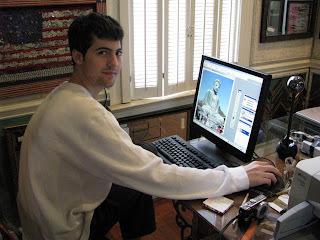 For another thing, this is our first Thanksgiving without Alex. In a rage, he left home last February. He flunked out of the eleventh grade but we've been told he is enrolled in adult education. We don't know where he lives (though we think he's no longer in his girlfriend's car). He turned eighteen in September. For the past six years Alex performed in the local, civic production of the Nutcracker....despite the fact that he's not a dancer! Alex is a brilliant actor....when he wants to be one! Generally, Alex has been a party gentleman, a rat, and Mother Ginger. Steve and I just couldn't bear the idea of attending this production without seeing him in it. We decided months ago to spend the weekend in Washington, DC. A week before Thanksgiving I accidentally learned that Alex was, indeed, performing in the Nutcracker....Friday, Saturday, and Sunday just after Thanksgiving. The only thing worse than seeing the show without him would be seeing the show with him. Either way, I'd end up in tears. So, we decided to go to Washington, DC as planned. I'm glad we did. We had a wonderful time....seeing all sorts of shows and art while trying to forget that our family is in ruins. Steve and I went to see San Francisco Ballet's Giselle at the Kennedy Center. Likely, this is my favorite classical ballet; the show was marvelous. It was nice to see Sasha de Sola and Gaetano (Guy) Amico, two dancers we've known from Mathias' days at the Kirov Academy of Ballet, and Mathias' friend Isaac Hernandez. Tina LeBlanc and Gennadi Nedvigin danced the leads but I was more impressed with Rachel Viselli as Myrtha, Queen of the Wilis, and Pascal Molat as Hilarion, the gamekeeper. 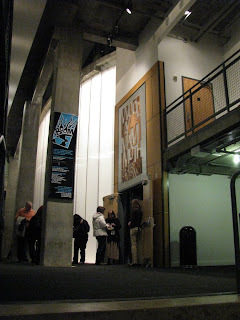 We also went to Wooly Mammoth Theater to see Boom, a fantastic new play (2007) by Peter Sinn Nachtrieb. Aubrey Deeker, Kimberly Gilbert, and Sarah Marshall were directed by John Vreeke in this sold out production that has already been scheduled for an extended run. It was absolutely terrific. Generally, I don't attend live theater because my hearing isn't very good; but the new theater's acoustic and the professional abilities of each actor to project his/her voice made every funny word clear. The set was perfect; the lighting was perfect; the acting was perfect. This show ran for a straight ninety minutes, no intermission; and, everyone sat on the edge of his seat, totally wrapped up in the play. I feel sure this show will travel to other theaters....and when it does, see it! Before the theater, Steve and I stopped into Teaism, a great chain of tea houses in the area. Many such places carry the work of local artists, but this was the first time I saw a fiber piece! I had to take a photo of Addison Paige's framed art quilt. Later I googled her name....and she's worth checking out! Quite talented! Steve and I also saw Women of Our Time: 20th Century Photographs at the Smithsonian Portrait Gallery. We love this sort of exhibition. The images are fantastic and the explanations make learning something so much fun. It's a blast to recognize a woman and then see that Edward Steichen snapped the image. It was fun to see what certain ladies looked like who were previously just a name in history. Yet, the photo show that really resonated with me was Role Models: Feminine Identity in Contemporary American Photography at the National Museum of Women in the Arts. There were several images whose concepts are still haunting me, like Catherine Opie's work. I over-heard a few ladies who were quite upset with Opie's images, but I couldn't take my eyes off them. Presented in a straight-forward manner, I felt all the pain of being "different" but also the desire to be seen as a whole, worthwhile, talented person. I felt compassion. The work left quite an impression on me. In a sense, they were shocking but drew me in and made me think. These one of the three images made me want to really know this photographer and see more of her work. The images that I found most disturbing were those of sterotypical girly-girls in pretty pink settings! They were meant to be confronted, of course! They subtly made my skin crawl with the idea that this was supposed to be "perfect", an ideal that I was suppose to try to achieve. They made me think about what feminity means. 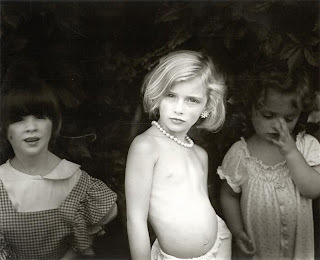 We've also always admired Sally Mann's photography. (I've even framed one!) They make the viewer think too. It was an enlightening show and included this photo of Sally Mann's daughter that I found as powerful and challenging as Jessie as Jessie/Jessie as Madonna that I think I saw years ago at the Whitney in NYC. I've also gone to the newly opened 701 Contemporary Art Center to hear the panel discussion by the artists first exhibiting in the renovated textile mill, including Ellen Kochansky who is in the midst of a residency. 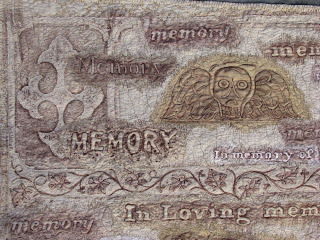 I can't wait to see her installation of fiber arts that incorporates material and memories of the mill and the people who once lived and worked in the immediate area. I'm hoping to ask if I can send visitors to her on Fiber Day....to see her space, her plans, and an exhibition in progress.